New Moon in Gemini on May 24, 2017 is/was a potent super new moon if for no reason other than we are in a time of massive cognitive dissonance, and Gemini and Mercury are all about the mind. This new moon is ruled by Mercury, the planet of communication, critical thinking, and the beautiful and trepidating landscape of good old fashioned conversation. Conversation, communication among the humans can be a slippery slope these days as the collective has been so incredibly polarized and paralyzed by a propaganda machine which has been expertly crafted to muddle and confuse us about critical issues, facts, and truths. This tactic of disinfo is by design leading us away from truth by reversal and cognitive dissonance https://en.wikipedia.org/wiki/Cognitive_dissonance, calling the truth tellers liars and in its extremity, murdering those who speak out; truth seekers and truth speakers and competent researchers are quite obviously being denigrated and smeared, a ghoulish facet of the Pluto in Capricorn era. We are at a time in our humanity when we are called to see the truth, to think critically and clearly about that which is important to the surviving and thriving of all species. This new Moon in Gemini is pulling the curtain back and inviting us into a deeper dialogue within ourselves and others about our values; what we value and how we express those values. It is a timely act to identify and articulate what is of value to us as Mercury is in the earthy fertile and fecund sign of Taurus. 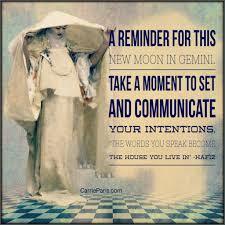 Food, water, air are topics of importance under this Mercury assisted new Moon. In addition, I think of Ceres, assigned as an asteroid, but weighty enough and visible enough in my mind to be classified as a planet, as a co-ruler of Taurus. The story of Ceres is the story of the descent of Persephone into the underworld to grapple with demons in most horrific ways, as is most often the case when in the company of demons. So there is a quality of this new Moon which takes us into the mental undertow in relationships, sorting out the truth from fantasy, fact from fiction. I clear my mind of clutter and debris. I now take time to clear my thoughts and rest my mind. I easily can discern my personal truth, my mind is strong and clear. I easily focus on projects and people that I value and value me. There is so much to look at, to think about, to feel as we are now living in these wacky days between worlds, right out of the gate of the four-plus years of Pluto-Uranus squaring off. It can be easy to feel so damned overwhelmed with the mess of confabulated convoluted issues that all we can do some days is pull on our pants and make a bowl of oatmeal. That’s okay; we’re all feeling the stress and strain of the acceleration of these times. 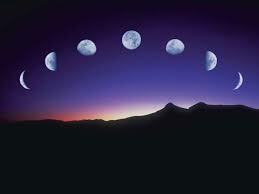 And generally the next day will get better as the Moon shifts her position. We all need to be kind to ourselves on the days when the chemtrails are heavy and loading us and our planet down with nano-particles of metallica or we can’t seem to remember where we parked the car. Remind yourself you’re strong and it’s okay to be confused and bifurcated (Gemini); commune with a favorite tree (Taurus) or a like minded comrade and sip a delicate French Rose on the patio. Remember: We are in a cycle of metamorphosis (and when haven’t we been?) and you can still imagine who and what you want to become and that you too are being imagined by the great conscious being that is breathing us and feeding us. This communion is a most sacred union and the awareness itself is what makes us truly the beautiful and creative species we are. This imaginal reality, a primal truth, is Mercury and Earth in their most ecstatic dance, and Gemini is hosting the event.